The new Spock rocks a beard. Thoughts? The actress passed away on October 7 at the age of 74. Captain Kirk has a Christmas album coming out soon. Leonard Nimoy and Zachary Quinto's successor is here! Will you be adding them to your library? The sound effects guru gave us communicator bleeps, Tribble purrs and whooshing bridge doors. Shatner's albums will sound better than ever. On July 12, the actor and composer passed away at the age of 85. Find out how Marc Okrand came to create Klingon. The author won a Hugo Award for his script for "City on the Edge of Forever." Kirk reported to bridge… in 2018! Shatner, Nimoy… and Eddie Murphy? 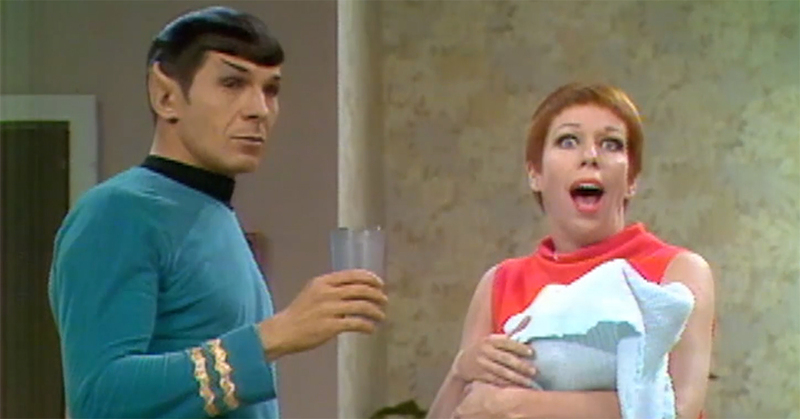 With a quirky sense of humor and an aversion to taking himself too seriously, Nimoy was a favorite among Star Trek fans. Or at least send your name up there with his. Did you know Gene Roddenberry had his ashes launched into space? Both Roddenberry and Doohan have visited the final frontier. It's hard to believe it's been three years since Leonard Nimoy died. From jumpsuits to lavish loungewear, what's more stylish than Star Trek? Did everyone who ever used the transporter actually die? Which of the five boxes and toys would you collect? Who could forget that classic 'Star Trek' episode with the… space helicopter? There are no small parts, just small actors, right? You can once again yell "KHAAAAAAAN!" at a big screen. These celebrity Trekkies should appear in the Star Trek universe. Gucci catches on that Star Trek is awesome with "Gucci and Beyond"
The fashion house features transporters and aliens in its latest collection. "I shall go to the mines for about ten minutes, then talk about it to the girls at yoga..."
Listen to a 13-song playlist of Trek-referencing pop songs, from the Weeknd to Jimmy Buffet. Opt for spending the day with like-minded Trek fans on Twitter. When you get to spend your Sunday night watching Star Trek, it doesn't seem so scary anymore! Deltas are the new herringbone. Ever wonder why the women on 'Star Trek' appear out of focus? Your eyes are not getting misty. The original Enterprise crew did not have a phaser rifle. So one man built a perfect replica for himself. Prepare to assimilate a whole bunch of 12-sided dice. Ever wanted to see a runabout next to a Winnebago? The comedian revealed that his early act was largely inspired by Kirk and Spock. From one Kirk to another: Chris Pine goes all William Shatner. Being a redshirt isn't as bad as it sounds. The talented monster man played memorable space aliens, birds on 'Bewitched' and comedic bears. There's a simple reason why they chose April 5th. There's a behind-the-scenes reason the Romulans switched to Klingon spaceships. Adam Nimoy is open to a CGI revival of his father's iconic character. This cool prop gun disappeared for decades. Discover its fate. It takes a keen eye to spot the bubble wrap, missing fingers and North America. *Star Trek memorabilia not included. You'll have to wait a few more months to live out your Star Trek dreams. Star Trek's unicorn dog is adorable. Help us find him. A tribute to the greatest space dog ever, the Alfa 177 canine from "The Enemy Within." All you need is a printer, scissors and a lot of patience. The man who made Spock's ears worked for the C.I.A. Pioneering makeup artist John Chambers helped Jonathan Harris overcome a fear — and helped free hostages. You've done it again! Here are your awesome #AllStarTrek tweets. Have you ever heard the lyrics to the theme from 'Star Trek'? #AllStarTrek is the best way to start off the new year. Common office furniture was used to make Kirk's seat. You probably once played with the same prop used for the Captain's logbook. A long holiday weekend in the captain's log. Star Trek's computers were more like Jell-O shots than circuits. Star Trek changed the actors' lives, just as it changed ours. Meet the man behind the charm. This was an emotional rollercoaster for some of our favorite female characters. The stand-in for Bones, Billy Blackburn captured great footage on his 8mm. Before he went sci-fi, Gene Roddenberry was Semper Fi. The time may have changed, but #AllStarTrek remains the same! Humans, Vulcans and Klingons alike all love their cuddly pets. One brewery in Halifax is combining its love for Star Trek and suds. The actor hopes to celebrate the show's 50th anniversary with a special and some songs. Yep, it's #AllStarTrek tweet recap time: Halloween edition! We might have started over with TOS, but you guys are staying fresh. "He loved playing Spock," says son. Put a little Spock in your stocking. We'd be okay with this change. Just don't mess with the music. The film lab was not aware some actresses are meant to be green. 50 years after the original series' release, lost documents by Gene Roddenberry were found. It's a small world. Or should we say "Nanu-universe." These awesome replica costumes look like they walked straight off the set in 1966. The restoration of the original Enterprise revealed surprising details of the ship's defenses. The markings on the starship's saucer are no longer a deep mystery. What do you consider the first Star Trek episode? It's stardate versus air date. "The Man Trap" against "Where No Man Has Gone Before." Grab an ahn'woon and enter the arena! Watch the Marching Jayhawks pay tribute to Star Trek. There's a material reason Redshirts always died. Bottom line: 7 of 9 has finally arrived! The Star Trek creator rescued passengers from a plane crash in the Syrian desert. A new comic strip tells the tale. A favorite prop and a favorite pop. A British Trek convention brings together Beverly and Wesley. Bottom line: We've got some pretty cool promos. The man is a philosopher.